You’ll be aware that any race meeting in Ireland that lasts for more than one day is a festival. So it was that we decided to re-visit Bellewstown, scene of some very successful punting back in 2000 and 2001, fortheir August Festival. Before setting out there was the usual Ryanair IQ test to try and secure flights that cost something in the region of the advertised prices. It’s not a particularly great experience travelling on Ryanair but the flights are generally on time and what’s more the flights from Birmingham only last about 40 minutes. Amongst other things they now charge for checking-in atthe airport with additional charges for each suitcase placed in the hold. So hand luggage only is the key these days, check-in online and print your own boarding pass. Talk about DIY flying. Anyway I got the cost pegged at about £30 return to Dublin – pretty good. As for accommodation - another value pick. If you like yourcreature comforts then this one is not for you. But if you want somewhere tolay your head after a few pints in Temple Bar I highly recommend Mercer Court Campus. This accommodation is part of the Royal College Of Surgeons and is onlyopen to the general public during the summer months. 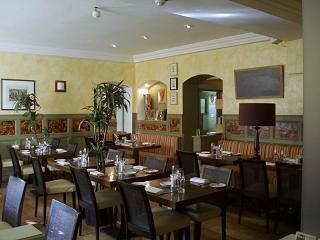 It is situated just 50 yards from the top of Grafton Street. Single rooms with ensuite shower and colour TV cost 30 euro a night. Continental breakfast included. Adrian and I flew from Birmingham and met Richard, the third member of our party, at Mercer Court. We had booked three nights’ accommodationstarting Tuesday with the racing to come on Wednesday and Thursday. It was off to La Mer Zou on the Tuesday night as this would be our only chance to relaxover dinner (the race fixtures were staged roughly 4.45pm to about 8pm). I’d not eaten here since 2006 but it had changed little. The only nod to the credit crunch looked to be the availability of the early bird menu (usually cut-off at 7pm), which was on offer all evening on Mon/Tue/Wed. The three course fixed price menu was competitively priced (in this now expensive city) at 26.50 euro. There seems to be a practice in Dublin of offering these fixed price deals and then loading them up with expensive supplements but this tactic was not exploited here. Having said that we all went for the three euro supplement starter - Kilkell fresh crab meat served with a gazpaccho sauce and avocado puree. Superb. My choice to follow was roasted cod with chorizo, chick peas and lemon aioli and we all finished with warm peach cobbler, poached peach, passion fruit and mango sorbet. All top drawer stuff. La Mer Zou: little change over the years. Little did we know the transport hassles we would face trying to get to the racecourse the following day. It stated on the Bellewstown website that Bus Eireann ran special buses to the track. Indeed that is why we had not hired a car this time. It turned out that the special bus service had not been running for some years – either from Dublin or Drogheda. And unlucky for us there was no railway alternative as the Malahide railway bridge had collapsed and fallen into the sea. Bellewstown is only 23 miles north of Dublin but the bus took an hour and a quarter to get toJulianstown about 8 miles away - from where we had to get a cab to the races. It was good to be upon the hill again but the changeable weather - hot and sunny one minute then torrential rain and wind the next put big pressure on the Ryanair hand luggage contents! The crowd looked quite small – no wonder if it takes so long to get there. The first day was 100% flat racing with a jumps card to follow on Thursday. Personally I prefer the usual mixed cards to this arrangement. The first two races were over 5f and the next four were over 1m with the last race over 1m 6f. In our previous visits the 1m race results were biased to the low numbers – something that we had benefitted from financially. However the 5f stats showed a slight bias to the high numbers. In the two opening sprints I played some tote singles and some high number forecasts without drawing. 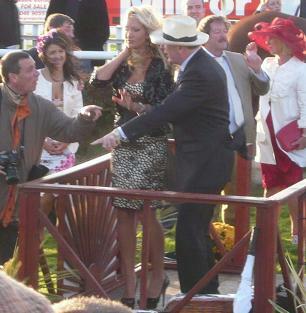 Very annoying, then, that trap nine won the nine-runner race and trap 12 won the 12-runner! Some joy in the first miler when trap one beat trap four thus yielding a forecast return. Many similar forecast attempts in races four, five and six proved fruitless but in the fourth race we noticed a bit of money in the ring for the reserve – Firm Foundations – 12/1 just before the off and showing 16.00 on the tote. Absolutely hacked up – led all the way. Tote return was 15.20 only just ahead of the 14/1 SP but a decent dent in the day’s losses. Always worth looking at the reserves, particularly if there is some encouragement in the ring. Losing day it was though with no luck in the lucky last. Whilst all this punting was going on we’d not really thought how we were going to get back to Dublin. Fortunately Tony from the tote offered us a lift as far as Swords, a few miles outside Dublin, from where we took another bus to the city. Time was getting on so the plan was to down a few pints near our accommodation. One of the establishments visited was Toner’s, a favourite and a lovely unspoilt pub. It was around 10pm when we enquired about food. The landlord informed us there was nothing left except two (toastable) sandwiches. Amazingly he served them up announcing there would be no charge for the food, as he would have been throwing them out if we’d not arrived! Very generous. On Thursday we tried to find an easier way to get to the track (and back). We phoned a car hire company and were quoted 26 euro for one day’s hire. But when we walked into their office 30 minutes later the price had mysteriously risen to 86 euro. So we decided to take the “fast” bus (train replacement) to Drogheda and perhaps pick up another bus from there. We met an Australian in Drogheda Ladbrokes (where we had ventured to get their early prices) who Adrian recognised from the previous day at the track. A conversation ensued about the ups and downs of the previous day’s punting. The Aussie was talking about race three and suddenly came out with the phrase “ I knew I should have played the emergency”. It didn’t dawn on us for a bit but he meant the reserve– Firm Foundations. What a great racing expression though! It turned out another cab was the only option to get to the races - 20 euro each way - but this gave us a chance to have a couple of hours after racing in Drogheda before heading back to Dublin. It was ladies’ day at the track. Caprice (a world famous model apparently) would be judging the best turned out lady later on, meanwhile we had to try and recover some losses. All the familiar faces were here – R Walsh, P Carberry, B J Geraghty etc. No draw factor (not that it was much use to us Wednesday) so we had to seek out the value on the tote. There was a 2,000-euro carry-over in the jackpot and another small crowd so I thought this could be interesting. Using Ladbrokes’ early prices and taking note of the market moves I put together a 5x2x2x6 perm. This would start at race three. No joy in the first race proper as Carberry scoots in on the favourite. In the second – a really weak race – I couldn’t find an angle so I chanced a couple of quid on the third favourite, which obliged at 16/1! A great start to the day. I was restricted to the two picks in each of the next two races. The favourite obliged in the next and then in the fifth, a three-mile hurdle, we were privileged to watch one of the most extraordinary rides I’ve ever seen. Ruby Walsh led from the off on Red Hot Poker – a big drifter in the market (Ladbrokes 13/8) SP 5/2. This is a very undulating track and he dictated matters by going very wide in the straights getting the best ground tight to the outside rail and then moving sharply inside to cut the corners and save ground. You really had to see it to believe it. So it was on to the fourth and final jackpot race (race six) with five runners (one non runner) running for me against the other five runners in the field. I placed a few hedging singles on the other runners, which were all big prices on the tote. Of the possible results going for me the favourite was marginally the worst result (even though I had two tickets because of my non-runner). Anyway it was the favourite that hacked up by ten lengths and I was therefore proudly holding two of the 13 winning jackpot tickets. Massive turn around, winning trip, all expenses paid. My amazing record at this track was intact. Caprice sporting footwear unsuited to the heavy ground. 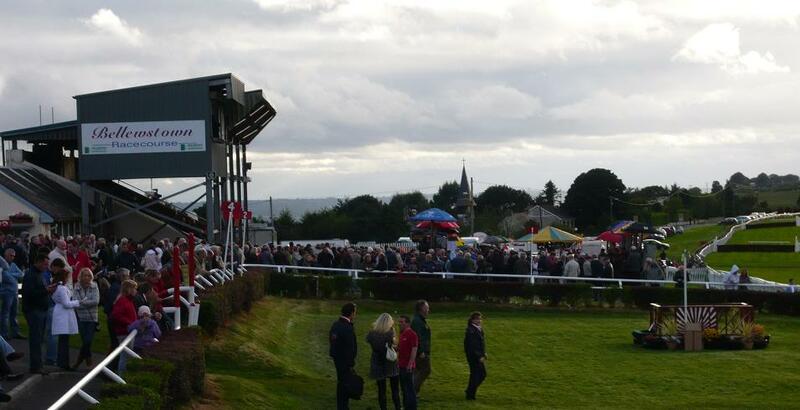 Just before the seventh race it was all over to the paddock for the results of the ladies best turned out. Caprice was having a bad hair day in the gale force winds and was also having trouble pronouncing the winning girls’ names. Whilst this chaos was still going on the course announcer shouted “ They’re off” – the bookmakers and tote operatives looked forlorn as hardly anyone had placed a bet having all been caught up in the Caprice farce! This was fortunate for us though as Nina Carberry easily won on the odds-on shot, which we definitely would have opposed. Lady jockeys preparing for the last. Our cab was waiting outside to take us back to McPhails in Drogheda for celebratory drinks. There was live music on here tonight but it didn’t start until 10pm so we took the last “fast” bus back to Dublin and found ourselves in Oliver’s in Temple Bar around 11.30pm. Guinness is a hefty six-euro a pint here, but we like this pub even though it’s a bit of a tourist trap. Some Irish dancing was just finishing and we feared this might be the end of the night’s entertainment. But no worries as various musicians started to arrive in the lead up to midnight. 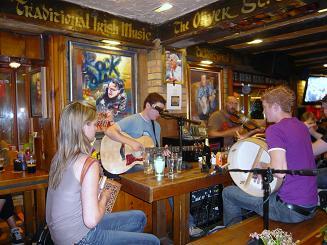 They close at 2.30am (apart from Sundays when it’s 1.00 am) so plenty of time to enjoy some traditional music and some rather expensive pints. It was after midnight in Oliver’s and the music was just starting up. Friday morning rather bleary eyed we checked out of Mercer Court and took in a bit more of Dublin’s atmosphere burdened only by our hand luggage. Although it was packed with harried office workers rather than plotting revolutionaries. Sea bass fillets were the special lunch offering, served with tomatoes, spinach and ratatouille; a bargain at nine euro. The food was bliss and so was the name of the café. Time for a final pint in Davy Byrnes – another bargain at only 4.75 euro! - before the “express”coach back to the airport.